U.S. History Exam Review Catalogs and Activity Guides created by past Student Historians use our vibrant collections to bring history to life. The guides connect tangible objects to key test themes, topics, and vocabulary to help students prepare for the U.S. History and Government Regents Exam. Learn about the Vietnam War through the stories of men and women who served in the military or were engaged in social activism during that era. These oral histories were developed, collected, and produced by the Summer 2017 Student Historians. 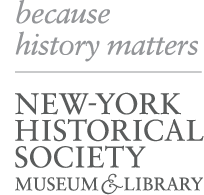 Keep up to date with how teens are making history at the New-York Historical Society. Learn about the students in our current programs, connect with alumni pursuing their academic and professional careers, and explore the stories they have uncovered and the materials they have created. Explore the literary history of New York City through walking tours, many of which were developed by participants in the Scholars Program for Teens. These unique itineraries explore the buildings and streets of Manhattan through the many writers who have lived and worked here. Inspired by artist Camilo José Vergara’s time-lapse photography, Teen Scholars shot before-and-after images to preserve history in their own terms and produced a documentary of their photographs and related research.